We can create truly one of a kind pieces for any event such as a wedding or business dinner. Our creations can be personalized to show your individuality and your guest will be able to take something home with them that will be an everlasting memory of the special event. Kentucky state displayed on a horseshoe base. 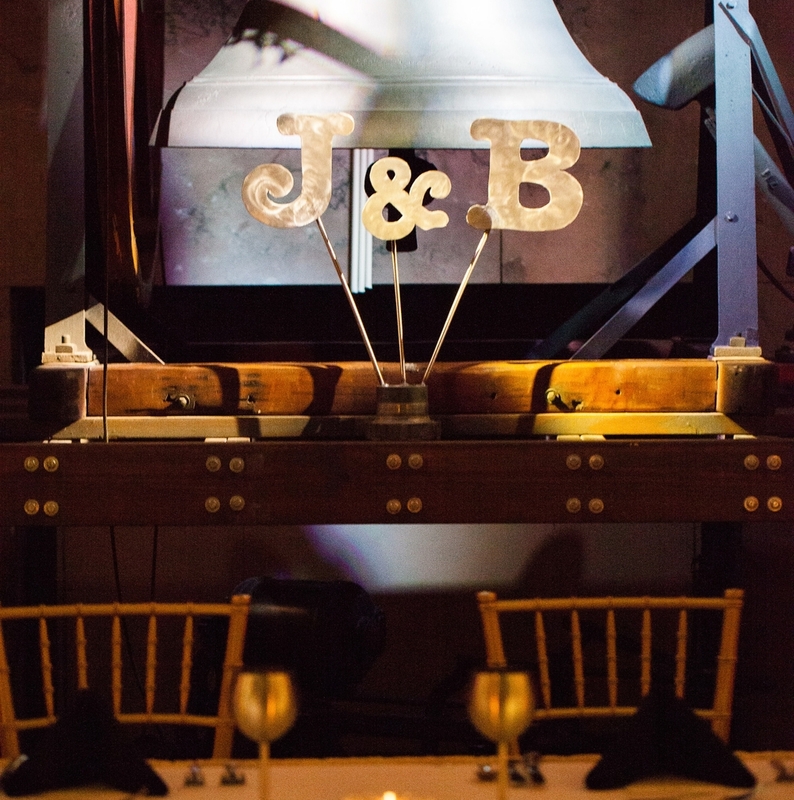 Custom initials displayed on a gear for the head table decoration. Ohio state displayed on a alternator fan. 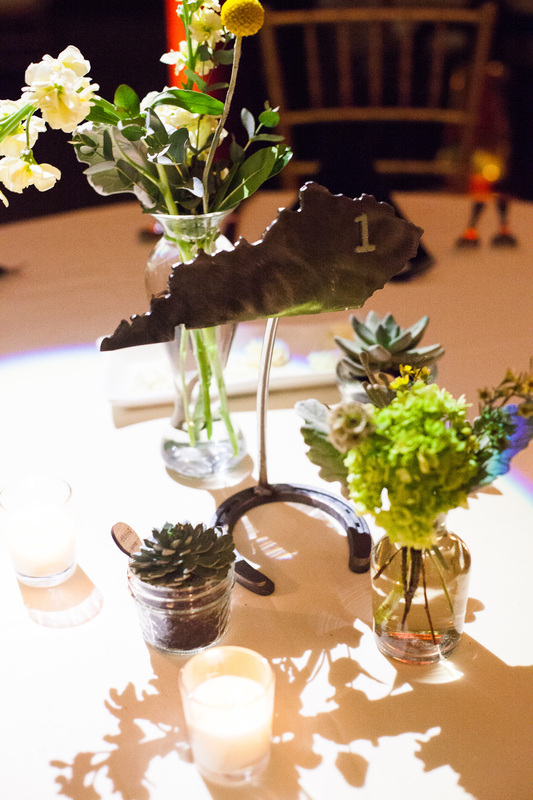 We had the pleasure of creating table number centerpieces for two of our amazing clients. They proposed the idea of using their home state, one from Ohio and the other from Kentucky. They wanted the pieces to have an eclectic feel along with an industrial aesthetic. We decided to create stands for the states from miscellaneous objects such as horseshoes, gears, rebar and other various metal shop parts. We also created a centerpiece using their initials to display behind the head table. It was a true success and we were very thankful to be apart of their special day. For this project, our client requested we recreate their logo in metal for a business dinner gift. They were placed in front of each place setting for the employees whom attended the event. As for the fabrication, we welded two separate pieces together to create dimension. When it came to the finish, we went with a classic look - polished steel with a satin clear coat. 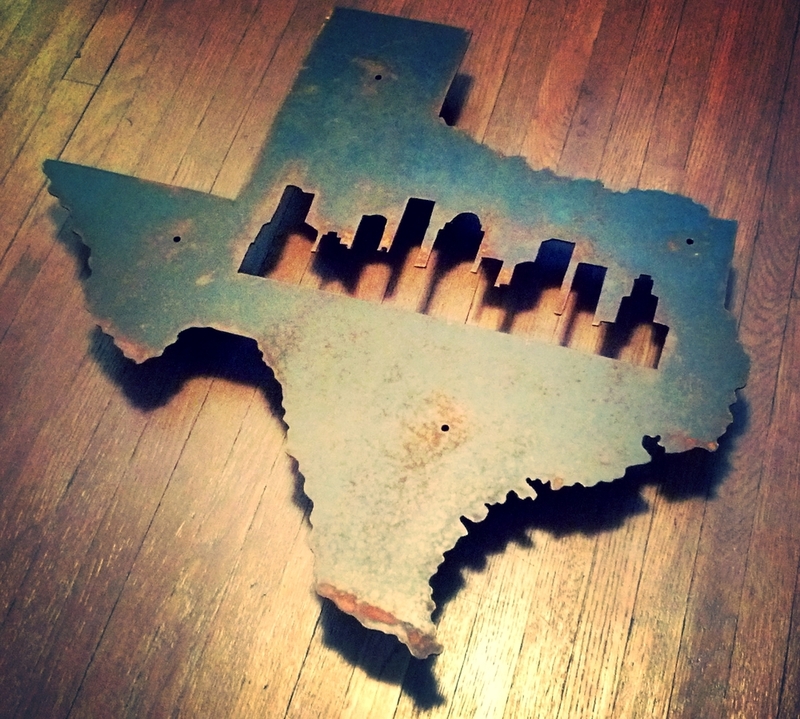 Custom State with a city skyline - Texas with Houston Skyline shown above. We can create any State with a city skyline of your choice. Custom 12" Ohio with initials cut out and a heart over Oxford. We can create any State with custom letters and a heart over a special place of your choice. We can create custom letter on rebar for any occasion such as last names, favorite city or any saying of your choice. We all search for that perfect gift for our newlywed friends,so why not take it a step further and give them something custom to remember their special day? We can create one of a kind wedding gifts for that special couple. For example, we made a 12" silhouette of Ohio with the last name of the newlywed couple in the center with a rustic finish. If you would like more information regarding centerpieces and/or gift ideas,please fill out the form below. Thank you for your interest in our custom centerpieces, we hope to be able to work with you on your special event! We will get back to you in a few days with more information.